James F. Fries of Stanford University proposed a hypothesis in 2000 called ‘compression of morbidity.’ He suggested that the change in life style had occurred in the twentieth century where the burden of healthcare had shifted from treating infectious disease in the early 1900’s to more than eighty percent of illness, morbidity, mortality, and cost is after age 65 from chronic disease. “Compression of Morbidity in the Elderly” – PDF file. 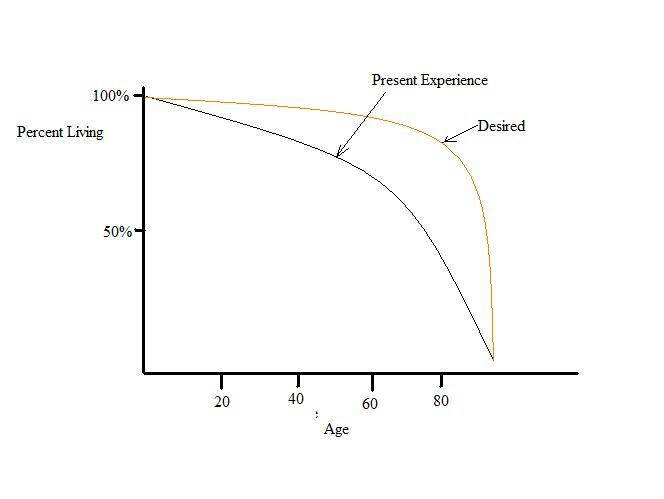 Fries suggests that by better nutrition, exercise, and medical treatment that the curve representing decline has become more rectangular. That is more of the population lives longer with a longer period of morbidity. 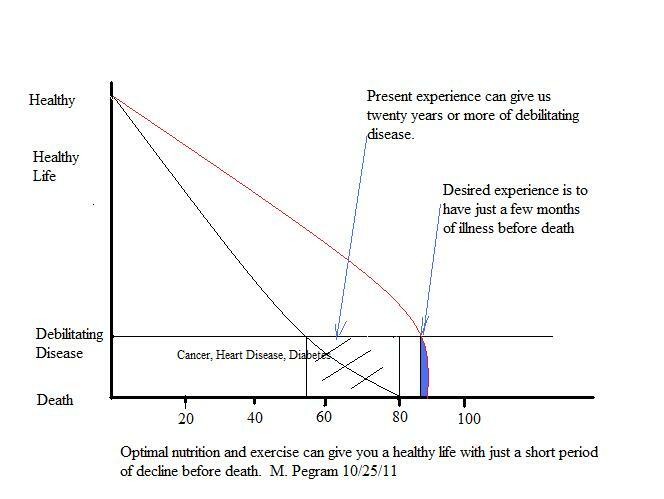 Fries then says that there can be compression of the time in morbidity and disability by reducing ‘lifestyle health risk.’ Justification of this shortening of time in decline has been used to make many changes in how preventative medicine is performed. The ideal then would be to have just a short period in which we are disabled just before death. Dr. Robert Heaney in his presentation ‘What is a Vitamin D Deficiency’ makes the point that vitamin D is the ideal candidate to achieve the shorten period of decline. So being sure that you are replete in vitamin D does not only extend your life by approximately ten years, it also gives you a better quality of life. Dr. John Cannell, Vitamin D Council, goes on describe comorbidity or having more than one chronic disease as vitamin D deficiency syndrome. So what happens to a society that makes this decision and chooses to look better and feel better for a longer period in their life? This could mean a significant reduction in health care cost. A reduction in healthcare cost would mean the health related economic segment could shrink drastically. So the longer period that people are sick and the more people are sick means this is a booming economic segment. To better understand how economic forces have prevented us from looking and feeling better, consider that presently the health segment of the economy is about twenty percent. Instead of talking about dollars, let’s talk about people being sustained. 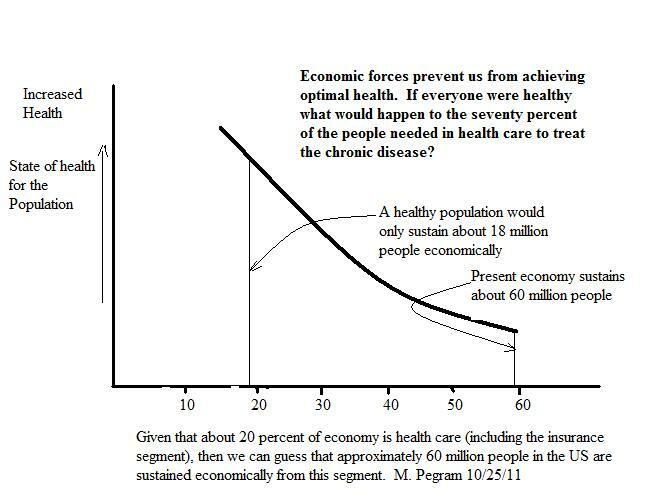 With three hundred million people in the US about twenty percent would be sustained by the health economy or sixty million as a first guess. This would be true whether your wife is a doctor or you husband owns a cleaning business that specializes in cleaning medical facilities. If some new magic understanding like vitamin D, as Oliver Gillie described it a ‘magic shotgun,’ would suddenly improve health eliminating chronic disease, this segment of the economy could shrink by seventy percent. The government completely understands. Former secretary of Health and Human Services, Michael Leavitt, under George W. Bush even stated it in his priorities. Of his nine principles, number four is, ‘markets before mandates’, and number nine is to ‘value life.’ “It’s the economy stupid” and the government considers it more important than your life and you can forget about looking and feeling better. The reason, what would happen if you eliminated the source of income for forty million people in the US? Of course we did it to the tobacco and manufacturing segments of the economy, why not shrink healthcare? I think their campaign contributions are larger. If the population in general understood that there could be half a million less death in the US every year but forty million less people being sustained economically, which would they choose? I have written about this early in how the governments understanding of economics is what is keeping us from health. October, 2009 ‘Major Newspaper Gets It’. What a two edge sword – the income of forty million people versus your health. So we have been disconnected from ‘mother earth’ in ways I am not sure that we understand. To think that we have moved from infectious disease to chronic disease as our concern in one hundred years seems alarming. Which is better, to live a short healthy life and die from an infectious disease or live a long life with a very long period of morbidity? I would like to think it is possible to live a long healthy life with a short period of morbidity, but that does not fit our present economic paradigm. As I write this I am watching over a thousand pink gloved medical workers in West Columbia dance for breast cancer awareness. What a great marketing campaign to raise money for the medical industry and it looks like fun and they have jobs. Will that do anything to prevent breast cancer? Forty years of trying by our institutions has made it worse. How could it be – just maybe you are on your own when it comes to looking better and feeling good. This entry was posted in Healthcare, Nutrient Deficiency by Mark Pegram. Bookmark the permalink. I am just learning about Vitamin D and only began supplementing about three months ago. In my humble opinion this was a SUPERB article and exactly matches my own thoughts and concerns about healthcare. I am a physician who has become appalled at the lack of attention to prevention, nutrition in our reactionary model driven by economics, government and other forces all unconcerned about health. Again, great job on highlighting these important issues. I fear it is a long struggle ahead to make effective progress on this front to any considerable extent. However, it is precisely that effort which keeps me awake at night and through much of the day pondering how best to proceed. Your article here has inspired me more by its important and insightful observations. Congratulations and thank you. Welcome to the world of health. I struggled with chronic disease for twenty years before I discovered nutritional deficiencies were the issue. How to get this understanding into medical practice is going to be very difficult because of the money. Thanks for you kind comments. thanks Mark…funny I just loved your article and assumed you were a physician or PhD in health to have such insights. I am even more amazed at your insights and convictions after reading just now your story after I left my comment. Personal experience obviously has had a role with you and others of course. I am an avid recipient of the sun….LOVE it…and try to get 30-60 minutes a day. Tougher now though as we head into winter. I would love to move to Naples Florida and practice nutritional medicine there. Given all my professional medical training led me to be an ER physician. I am contemplating a consulting practice to promote health wellness, exercise, organic gardening, and other strategies to optimize health. Now if I could just figure out how to earn a living at this. I am going to read some on the Vit D council website and do some CME’s. Way to go promoting Vit D….funny i was talking you up to my wife over dinner – great job. I hope you get more opportunities to speak on vit D and nutritional health.Lets keep in touch. One last closing point. I highly recommend you consider going “paleo”. A good website to check out is: Robb Wolfe’s, just google Robb Wolfe, paleo or Professor Cordain, Paleo. They are both respected authorities on Paleo. If you dont know anything about Paleo….hey….even better. I did not until 8 months ago even as a physician. Now, my day is filled with paleo. Try to maintain a balance, Faith/God, Family, then health. Let me know what you think of paleo. I don’t think a PhD or a physician would make the connections the way I have because of my broad base of exposure to different industries and institutions and my unique ability to solve complex problems. If they have they would not write about them in fear of their jobs.